One of my many hobbies is Robotics both experimental and movies. Below is a small sample of some of my robot collection. The first two photos are of my Hero 1 robot which was sold by Heathkit electronics in the mid 1980's. This Robot is in need of some repair work, the gripper was damaged which has been repaired. I also need to replace the gel cell batteries and finish assembling the radio control unit. 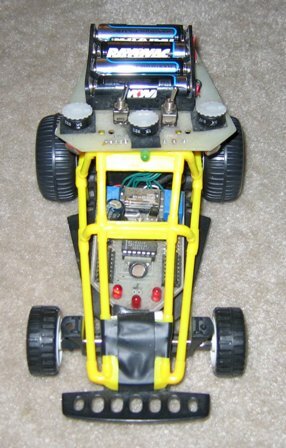 The next photo is of my Photovore robot project which was built on a remote control car platform. PCB kit was purchased from Johuco company this project was detailed in a early 1980's Omni magazine article. This robot has both light seeking and light repelling behavior depending on the switch settings. Has two CDS cells for 'eyes' to detect light and potentiometers to adjust the sensitivity to light. Next photo is a chrome robosapien which is an interesting toy but, I have a few modification plans for him in the future! Next is a group photo of some robot pets. 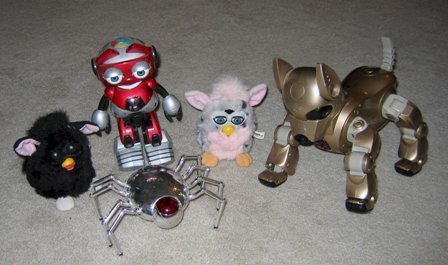 Two original furbies, a remote control spider robot, and I-cybie with the Z2 personality card which allows him to locate his charger and do additional behavior. Last photo is of some robot toys I have collected over the years. A couple of lost in space robot versions, a lost in space vegetable alien and who can forget the terminator T2 too! My newest addition which is not pictured is my Boe bot which is powered by a basic stamp. This is a very interesting robot with lots of programming flexibility. I am currently working on placing a Basic Stamp Home Work board on a RC tank tread base and adding a few sensors and other items too. Will have more information and photos as these projects progress.